As of Friday morning, an upper level low pressure system was over the region with it's counter-clockwise flow and unsettled weather, resulting in clouds and showers that moved little. By mid-day Saturday, the Omega Block will set up over the eastern U.S., with its distinct inverted horseshoe shape at the mid levels, which will keep weather systems at bay to the west. 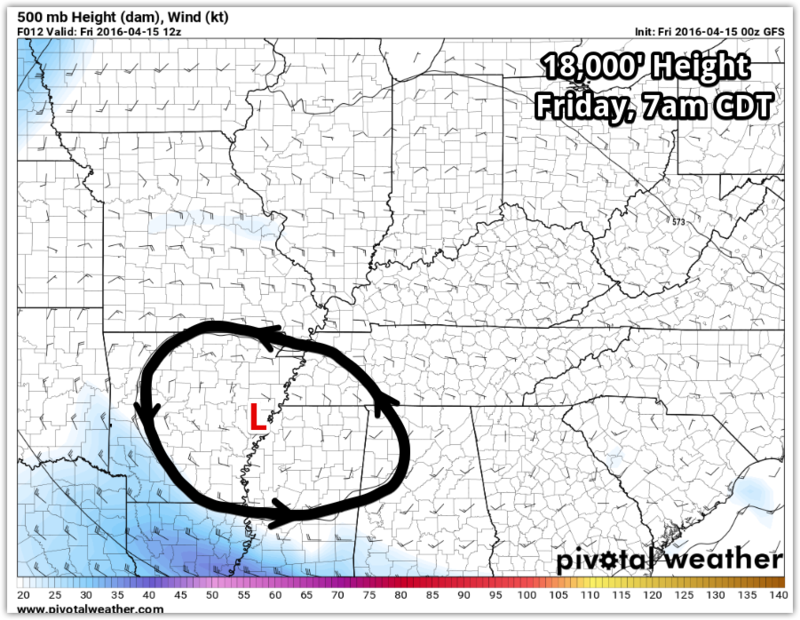 The black line with arrows represents the flow of air at 18,000'. Notice it's shape - like an omega symbol. The atmospheric setup is basically strong low pressure over the Four Corner (which is resulting in a major snow storm for the Denver area and Rockies east of the Continental Divide), low pressure over the west-central Atlantic, and a large area of high pressure covering the eastern half of the country between the lows. Air flows counterclockwise around the lows and clockwise around the high, resulting in the huge ridge between the lows. Because the ridge forces the jet stream up and around it, air doesn't flow from west to east like normal, but has large bends north and south. Warm and dry air is found under the high, while cool and stormy weather is found on either side of the block. This is fairly obvious in the surface map valid Saturday at 1pm that shows a lot of precipitation, particularly on the west side of the high, with a large dome of dryness under the ridge. The surface map and 12-hour accumulated precipitation for mid-day Saturday shows the effects of the Omega Block quite well. Stormy weather around the periphery of the block and dry and warmer weather under it. 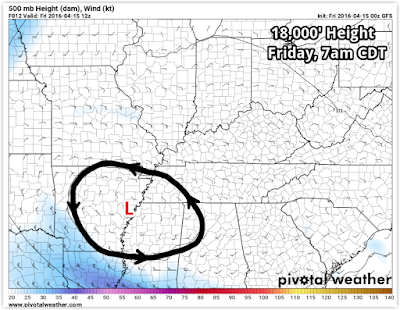 For the Mid-South, we'll still have lingering clouds tomorrow, despite the ridge taking over at the upper levels, as flow in the low levels will be from the southeast, pulling moisture around the south side of the surface high pressure area. However, we will start to warm up a bit and by Sunday we'll see a lot more sun and temperatures that reach the mid to upper 70s. 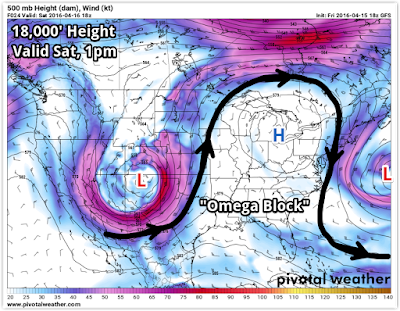 As we head into next week, the Omega Block breaks down after a 3-4 day run and the low over the Four Corners fills, or weakens, as it moves northeast into the Plains. 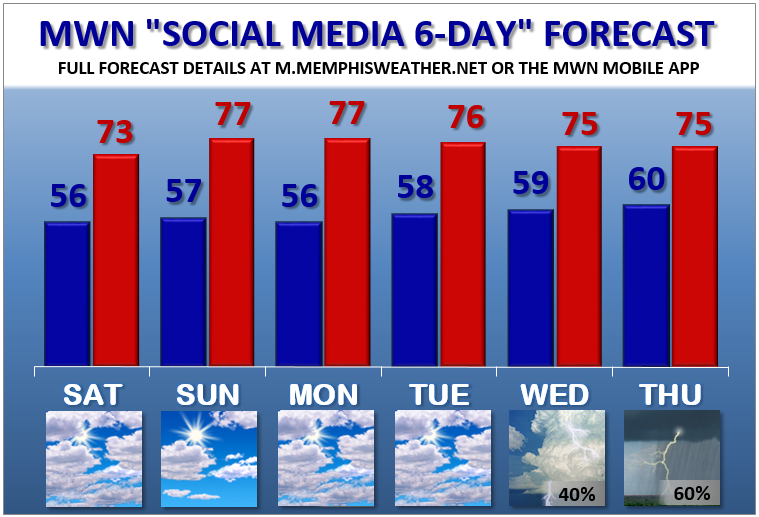 This will shift the stormy weather east, bringing rain and thunderstorm chances into the Mid-South from the west. 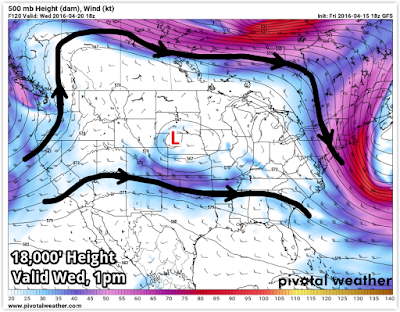 The upper level pattern becomes more "zonal," or west-to-east, which will allow the low to progressively move closer and bring clouds and rain chances. 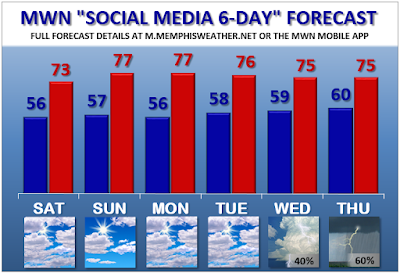 However, temperatures will still likely be in the mid 70s most of next week as lows remain mild, or near 60. By mid-week, the block will break down and the upper level low on the west side of it will move into the Plains. Flow across the southern U.S. will be "zonal," allowing weather systems to move a little more freely. However, the overall flow will be rather weak as the primary jet stream is well north in Canada, resulting in the Plains low being fairly slow moving. The surface map for the same time as above shows the surface low and frontal systems across the mid-section of the country, which will increase our rain chances again heading into the middle of the week. And looking even further ahead, the Climate Prediction Center indicates that much of the CONUS, and especially the eastern half, will have high probabilities of above normal temperatures for the last week in April. Who's ready for some 80s?? 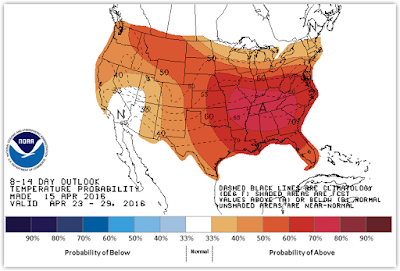 NOAA Climate Prediction Center outlook for the last week of March indicates a 70% chance of above normal temperatures. Perhaps our first string of highs in the 80s as we approach May?